Allows eating of food and bartering with merchants directly from world. Allows the PC to choose to eat food in the world without placing it in their inventory first. This applies only to prepared food. Raw food ingredients will still be placed directly into the inventory. Allows the PC to eat an infinite amount of food in their home. That means you can set up the perfect place setting with your favorite food and just leave it there so it's waiting for you each time you return. You can even do this with your spouse's Home Cooked Meal so you don't have to seek them out and ask for it each time (or so you can have one in each home you own even if your spouse doesn't live there). 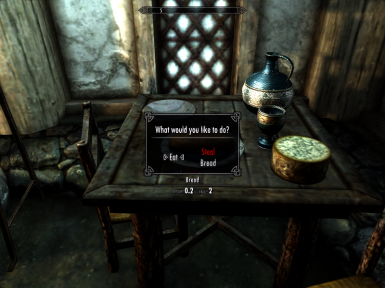 Allows the PC to order a prix fixe meal at inns and guildhalls for 15 septims by activating any food item or place setting. Corrects some inappropriate keywords for food. Raw food is now properly identified as raw food and cooked food is now properly identified as cooked food. In addition several items had no keywords at all which would cause them to not show up for sale by innkeepers. Also some potions were inappropriately identified as food causing them to not be sold by apothecaries. Allows the player to click on display items in stores and immediately enter the barter menu without talking to the store owner. 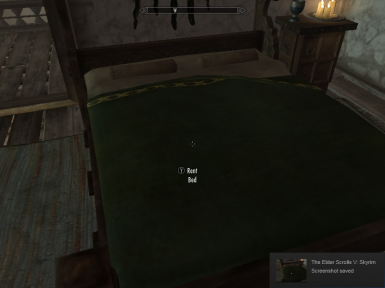 Allows the player to click on beds in inns and automatically rent them. 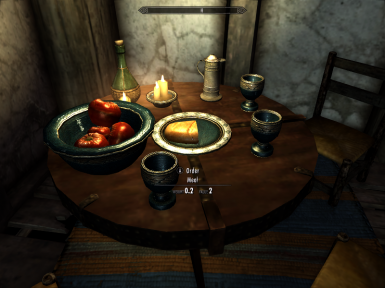 This file is probably of particular use to players who use Frostfall or a mod that adds hunger, as the ability to quickly and easily fill your tummy with hearty food from an inn saves time and tedium. 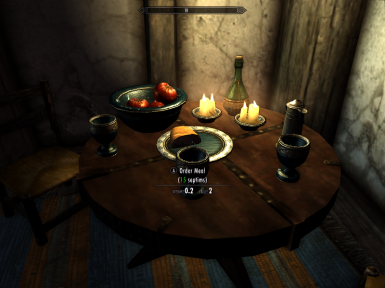 The word "Order" will show white if you have enough gold for a meal or red if you don't. 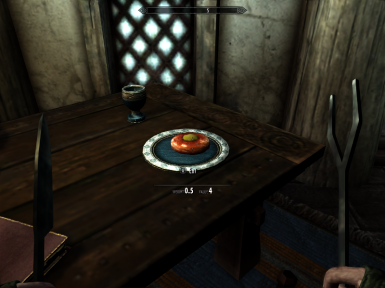 You cannot order a meal while sneaking. 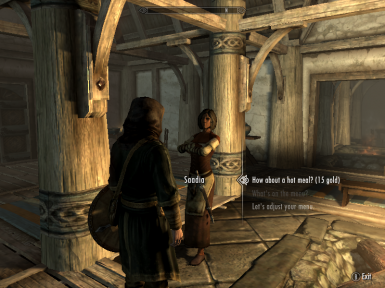 If you are sneaking, it is assumed that you are trying to steal. Eating food owned by somebody else is still a crime, even if the label isn't red. 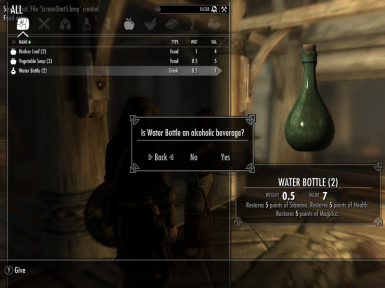 If you have a mod that makes sweeping changes to alchemy or alchemy ingredients, you should probably load it after this mod. 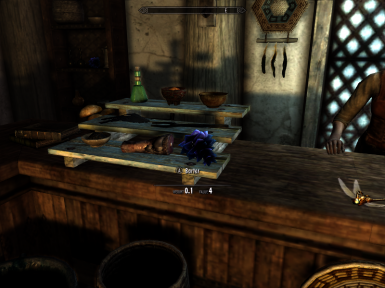 The reason is that a few alchemy ingredients were incorrectly tagged as cooked food. 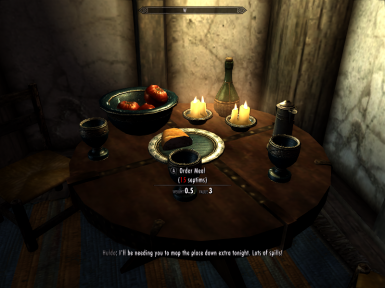 I corrected those keywords, but that also means that the vanilla values and magic effects of those ingredients will overwrite any other changes if this mod loads last. 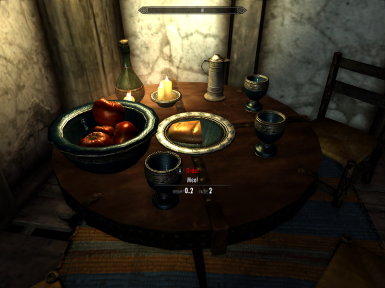 If you use one of the above mods, you should probably load it after this one, just to be safe. Exit any inn or store. Place all files in your data folder and activate the plugin. Delete the files from your data folder.